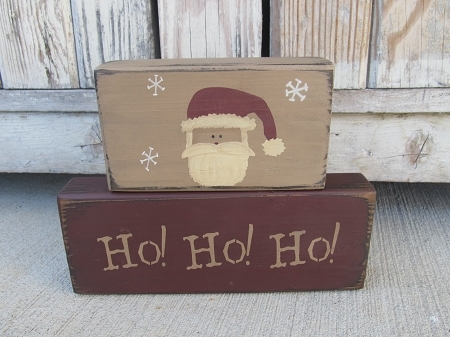 Primitive Hand Painted Santa Stacker Blocks Set of 2. 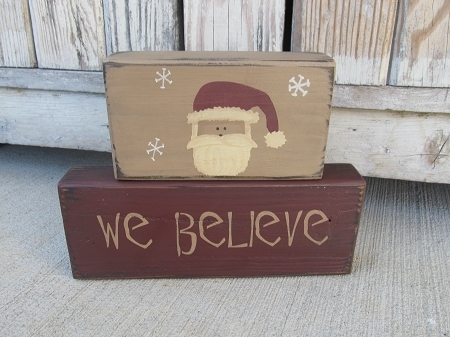 Adorable stackable blocks for your Home's Christmas Holiday decor. Who doesn't LOVE Santa Claus!!! This block set features a burgundy block on the bottom, with khaki tan stenciled wording. You have the choice between Ho Ho Ho or We Believe. Choose your favorite from the options list. The top block has a khaki tan background with a jolly Santa with snowflakes falling around him. The stack as shown measures 9" x 7" tall. 2" thick so they stand up nicely. Hand painted at the time of your order, designed and signed by Heidi.